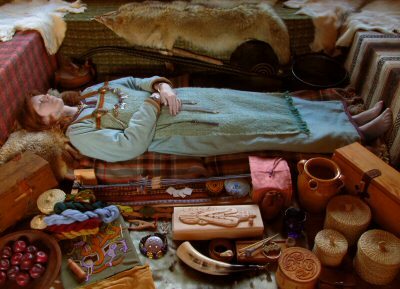 An important source of information we have about Viking life comes as a result of their burial rites. In the afterlife they would need the same type of things they needed in this life so they took them with them into their graves. This gives us a wonderful insight into what they thought was important. Imagine what you would take with you into another life if you could. Men generally took their weapons and the tools of their trade while women were buried with domestic equipment and their jewellery. Some burials were made in boats or even ships. Interestingly some people were buried in a ring of stones laid out to form the shape of a boat. We think that the Vikings believed that one of the ways to travel to the afterlife was by boat, perhaps if you couldn’t afford a real boat a stone one would have to do. Of course the best way to travel on this final journey was in the company of the Gods. Odin and his handmaidens the Valkyries searched the battlefields for the bravest of the fallen warriors who would reside in Valhol feasting and fighting until Ragnarokk, the twilight of the Gods. While Thor collected worthy peasants, craftsmen and thralls to his great hall Bilskirnir. Food and drink was often included in the grave too, presumably as a meal for this last journey. 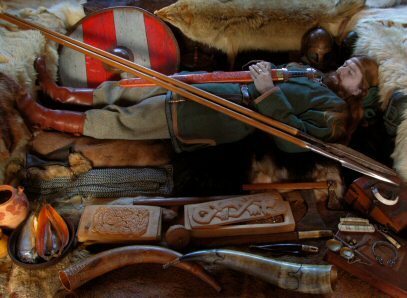 The Vikings ate fish, seafood, meat, bread, cheese, fruit and vegetables in varying amounts depending upon availability and wealth. Ale, cider and mead were the main drinks. Alcohol was considered safer to drink than water which it probably was because to make any of these drinks the first thing to do is boil the water. 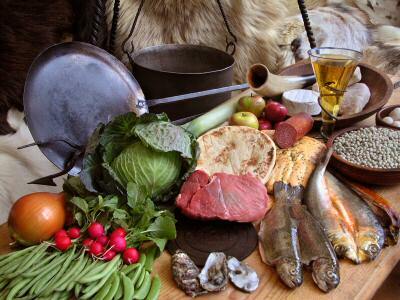 Preservation of food was an important skill, necessary to provide food in the lean cold months. Before Winter the spare animals would be slaughtered so the breeding stock could survive on what little available grazing was left. The surplus meat and fish would be smoked or salted to prevent it from rotting. Pulses like peas and beans could be dried. Grain was stored for grinding into flour to make flat unleavened bread. Most other foods would only be available in the seasons that they grew and would be eaten fresh.